My son is 16 years old. In early Sept., he hurt his elbow while pitching in his first Fall game. It also hurt a lot to swing a bat. After a physical exam and an MRI, he was diagnosed with a stress fracture of his Olecranon. The doctor - who specializes in elbows and pitching injuries - shut him down from throwing (or hitting or any other activity for that arm) for 8 weeks. On Oct. 25th doctor cleared him to start an 8-week throwing program to gradually work back to full activity. 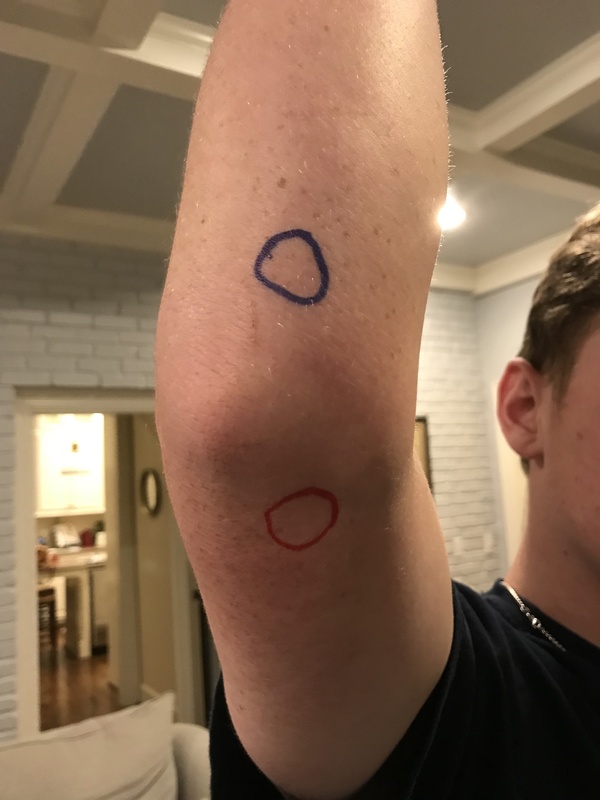 Last week - about 6.5 weeks into the program, he felt some pain in a different spot near his elbow. We can’t get in to see the doctor for another couple of weeks, so in the meantime I thought I’d see if anyone on the forum has thought about what this new problem might be. The red spot in the picture is the original injury; the blue spot is where it hurts now. Thanks. See what the doc has to say in a couple of weeks. If you aren’t comfortable with the diagnosis seek a 2nd opinion. Does your Dr specialize in sports injuries? I’m pretty sure he does. He was recommended to us by a doctor in town who works with other doctors all the time as part of her job. I later found out that a guy who pitches for the U. of Florida flew in just to have this guy do his Tommy John surgery. One of the things that’s confusing me is, with this new injury I started looking at elbow anatomy online, and it looks like Olecranon stress fractures most often occur where the new pain is - not the original pain. Wondering how long it took to recover from the stress fracture. My son had a hairline fracture according to Ortho and 2 months later he has pain when throwing. Any feedback greatly appreciated.